We only brat you the best for this episode. We promise. Hot or cold but nowhere in between! Wait a second… or 129 seconds. Pour one out for Watermelon! Why not fill a baguette full of ice cream scoops? So many berries for your pies! It’s like fiberglass for your mouth! It’s Autocomplete Friday! We look at the top 10 results for “Scotch” on Google. Seize the dae! And go grab a piping hot boat of fudge on your favorite ice cream flavor. It’s the water of ice cream! All the troubles you have will pass away very quickly. If winter comes, can spring be far behind? Good things are on their way. Straight-up, blended with ice, or melted in a cup! This Daiquiri is mine, not yours! They’re like Dippin Dots, but fish flavored! Who needs the internet anymore? We read Google Results for Peach Ice Cream! Are they cookies? Are they not? Are they round? What is a corn fritter? How do you feel about french fries? Which variation is your favorite? Is “FryDay” stuck in your head now too? Bugs can be food too! We once had a cat named Blueberry. If you like them, take them and come up with your own song! Located in the seedy underbelly of Bangkok, the Raisin and Spice Bar is home to some of the roughest and most dangerous criminals on Earth. Sebastian Heller is among the strongest of the bunch, and he doesn’t let anyone pass without first feeling the burning wrath of a Super-Street-Fighter-2 style Tiger Uppercut. Sing-Song McCracken forges the path behind with his signature Karate-Kid-3 style flippy kick. Thomas “The Tank” Engine will downright steamroll his foes without so much as a glance. Fortunately for you, New York Times reporter Laura Ghuitarre has made her way in to this closed community of killers. You can hear the grimy tales of destruction and mayhem straight from the source today. Can you stomach the sinister force of the Raisin and Spice Bar? Gordon Ramsay’s got a bone to pick with Kyle’s ‘ChickHameese’ concoction today! If you’d rather not have a savory dessert loaded into your caulking gun, try chocolate! Crunchy? Smooth? Quantum? How do you like your Whole Foods Branded Bread Dispenser? This Nashville specialty is a type of fried chicken covered in cayenne pepper. Please don’t listen to Kenny. He is NOT a lemon expert. Kyle tries to pronounce the German word for cake. Nourishing, vibrant, and without pretension, paella has held a place of honor and practicality in Spanish homes for centuries. This ancient leafy green has been part of the biggest recalls in food history! What’s that perfect chip to dip ratio? What even is a dip? Is chowder a dip? We answer the HARD questions. Water we talking about? We’re talking about access to clean water and how you can help! The French take their bread very seriously! And you should too! Get them steamed, fried, in sauce, or in a soup because today you’re eating those tiny pies known as ravioli. Oh no! You got some chocolate in my caramel! You got caramel in my chocolate! Whether you dip them in mayo, ketchup, or even store them in empty Pringles cans, we won’t judge. So many pears, so little time! Actually, 3,000 is quite a lot of pear varieties so even if you ate one per day that’d still be at least a few years. When your intestines are like noodles and Eric, the scientist, won’t stop eating soup. Take those scallops straight out of the oven and put them in your mouth! Bananas, or more properly “naners”, are a vital component in Today’s Special! Whether you like it crunchy, chunky, crispy, smooth, or soupy, we’re here to celebrate everyone’s favorite legume butter! 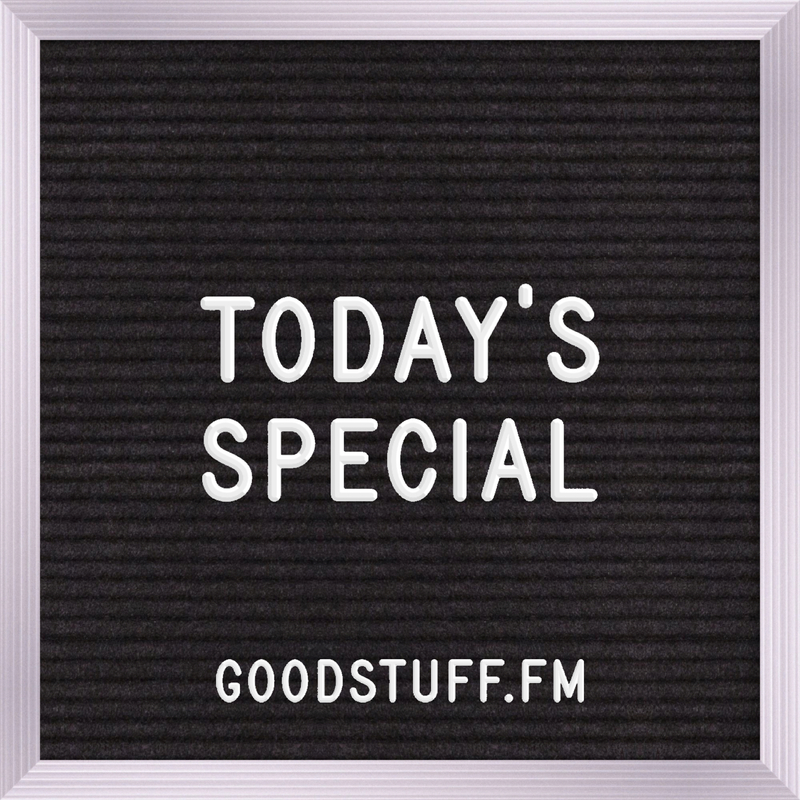 Kyle and Kenny are the hosts of The Goodstuff Morning Show on Goodstuff.fm and have been celebrating food days for nearly 4 years! Join them weekdays as they celebrate a different food each day.